As the Bookmobile/Outreach Manager, I am responsible for an annual budget of 323,131.00 (FY 2016). As in much public library work, salaries and benefits make up the large majority. Our next largest, and somewhat unique, expense is for vehicle maintenance. We maintain two vans for home deliveries and one large Bookmobile. Our custom Bookmobile has begun to need large and frequent repairs, often urgently. With a limited combined maintenance budget of $10,000, we need to make sometimes difficult decisions. I accomplish this by maintaining extremely clear priorities. First and foremost, our highest priority is safety for staff and patrons. If a repair has safety implications, we take care of it immediately. If needed, we suspend or use limited van service for Bookmobile routes until complete. Secondly, I support regular preventative maintenance; a small cost up front, before a problem develops, is exponentially cheaper and better for our patrons than an emergency repair. Finally, for all other costs we weigh the monetary cost and the impact on our patrons against the options for repair, for which we seek out multiple quotes and options. My team understands and shares these priorities, and demonstrates incredible resourcefulness. In order to address the long-term issue of a budget that is misaligned with our patrons' needs for regular Bookmobile service, I am working with my team to evaluate our service model entirely. Is a large Bookmobile the best way to meet our patrons' needs? What other alternatives do we have? How can we make whatever model we use more efficient and effective? This ongoing analysis will hopefully be an opportunity to deeply examine our patron's needs, and perhaps find a way to provide them with even better service. In this position, concurrent with my Bookmobile/Outreach manager role, I oversee a budget of 140,472.00 (FY 2016). Outside of salary and benefits, the largest area I coordinate here is for adult programming. This is a moderately complex budget line, as it is utilized by a variety of people across the system. This budget line is new, and reflects a new process for adult programs. In the past, each branch planned and executed its own programs, and so programming dollars were allotted to specific library locations. With me to organize a system-wide adult services team, we now plan and implement programs collaboratively. This led to confusion over who should pay for which elements of a program shared between multiple branches of varying sizes, leading to wasted time and potential conflict. I worked with our financial team to pull funds from a variety of existing programming sources into a central pool under my supervision. Now, anyone planning an adult program, regardless of location, can pull fairly from a central fund. I lead agreement as a group on how we prioritize those funds when expensive and high-impact opportunities arise. Then I oversee the overall utilization of the budget, using monthly reports, purchasing card statements, and direct communication to keep us on track. 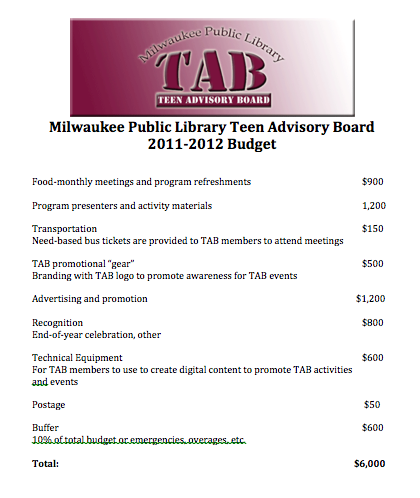 As a selector at Milwaukee Public Library, I managed an annual budget for several different collections. This gave me critical experience with budgets large and small. As the map selector, with a budget of only a few hundred dollars, I was frugal and creative; when purchasing history and travel books, with budgets closer to 10,000, I learned to disperse funds appropriately throughout the year. Prior to my career as a librarian, I was a theatrical lighting designer in Chicago. For each production, I managed a budget for lighting supplies. These budgets could range from little more than petty cash for single-use products to several thousand dollars for equipment rentals and installations.